Haywood County is the perfect home base for an action-packed family vacation. 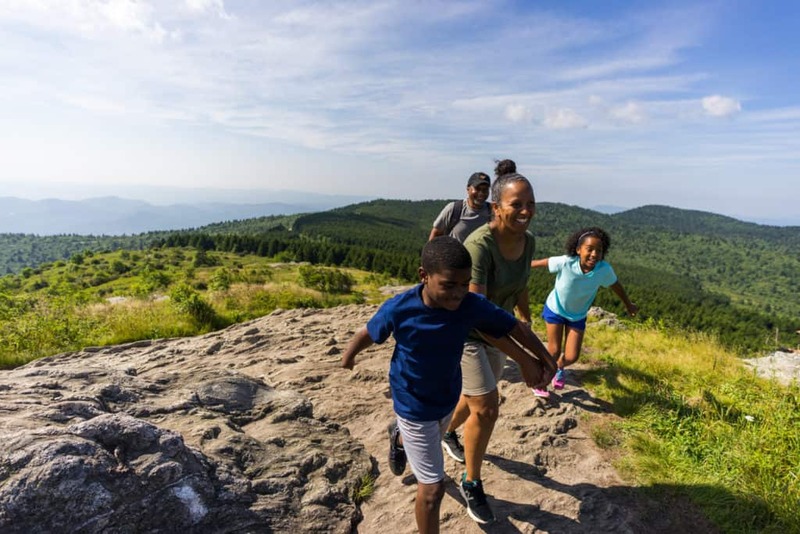 With a long list of outdoor adventures, incredible places to explore and a wide range of restaurants that appeal to palates of all ages, it’s easy to see why families love to stay and play in the Great Smoky Mountains of North Carolina. They say the early bird gets the worm . . . well, so do the trout! Purchase a three-day, $7.00 fishing license to fish in the designated Mountain Heritage Trout Waters in Waynesville and Maggie Valley. This special three-day license can be purchased online at www.ncwildlife.org or by telephone Monday– Friday, 8 a.m.–5 p.m. at (888)248-6834. Did you forget your fishing pole and tackle box? No worries! Stop by the Maggie Valley Visitor Center and pick up a free tackle box filled with six lures/flies and you can borrow either a fly rod or a spinner rod. What better way to explore the North Carolina Smoky Mountains than by horseback? Enjoy wildflowers, mile-high vistas, lush forests and the cool quietness of rhododendron tunnels as you ride through Cataloochee Ranch and the surrounding Great Smoky Mountains National Park. Half- and full-day rides available. Spend the afternoon with the reintroduced elk of Cataloochee Valley, which are most visible during dawn and dusk. The valley is one the most remote parts of the Great Smoky Mountains National Park and is rich in mountain history and beauty. The area is laced with abundant wildflowers and wildlife including elk, white-tailed deer, black bears, wild turkey, butterflies and many species of birds. With several hiking trails, streams and historic buildings from the early 1900s, there is plenty to explore in the valley. Find a cool spot by the stream and enjoy a delicious spread with the best views around. Spend the evening at Smoky Mountain Sk8way & Fun Zone, Western North Carolina’s largest roller-skating rink and family entertainment center, featuring over 20,000 square feet of arcade games, climbing walls, slides, an inflatable obstacle course and a brand-new wood roller-skating floor. Experience one of the area’s favorite U-Pick farms located in a fertile river bottom valley in the shadow of Cold Mountain. Depending on the time of the season, take your pick of flowers, strawberries, blackberries, blueberries and a variety of veggies. Don’t forget to also check out the on-farm market for a variety of produce, honeys, jams and other local products. If you’re lucky, you’ll get a chance to meet one of the farm’s lovable redbone coonhounds, which are always first in line to greet visitors. The 46-mile stretch of Parkway that runs through Haywood County is one of the most popular attractions in the area. After breakfast, hop on the Parkway just outside of Waynesville on Hwy. 23/74. Head north and make plans to stop at Richland Balsam, Devil’s Courthouse and Graveyard Fields (just to name a few). Your family will experience scenic trails, panoramic views, cascading waterfalls and much more. Enjoy one of the area’s best swimming holes, Sunburst Swimming Area. Take Hwy, 215 and head toward Lake Logan. Keep going until you pass Sunburst Campground on your right and the swimming hole will be the river area on your left. With two main swimming areas, this area is a local favorite for kids and adults alike! All the water originates within the mountains surrounding the creek, so you will find some of the freshest (and coldest) water around to cool off in. Find out who in your family has the best golf putt of all. Maggie Valley and Waynesville are home to three putt-putt courses that have been entertaining families for decades. Check out one (or more) and see who reigns master of the putt-putt challenge!